21 x 30 cm, 52 pp., full colour throughout. 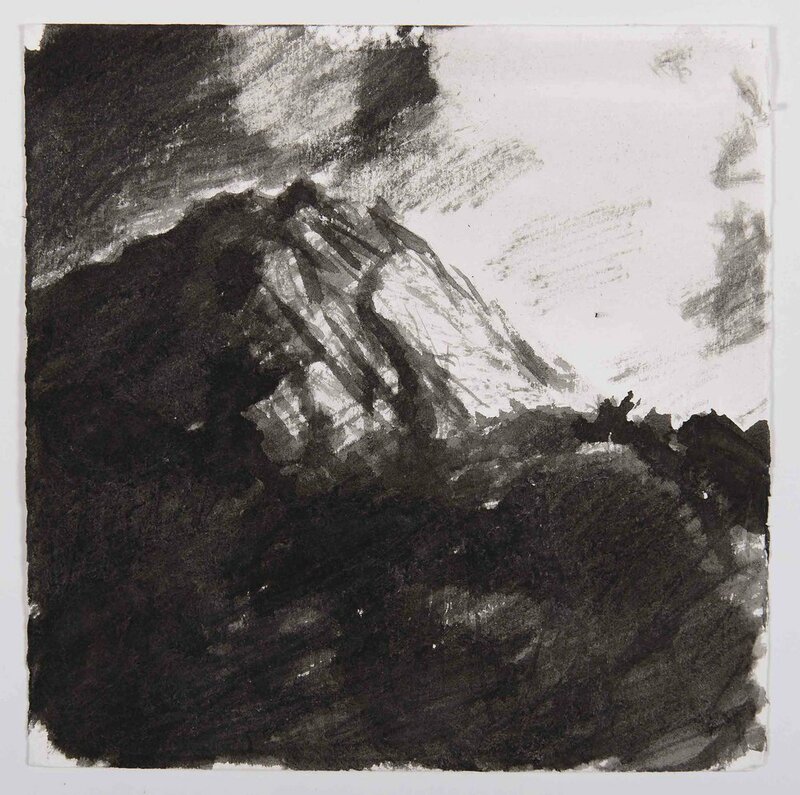 Into the Mountains presents paintings, drawings and monoprints derived from numerous sketchbook notes and photographs made by artist Joe Wilson during his wanderings in the Twelve Bens of Connemara. The images are accompanied by a vivid response of world-wandering ruminations on the fascination of mountains and the images they inspire from one of Ireland's most celebrated contemporary authors: Colm Tóibín. “…….I remember a summer day in the Catalan Pyrenees coming to the top of a mountain pass and being faced with what looked like a catastrophe of boulders, boulders running for miles down a valley. This was going to be hard, climbing down, jumping from one boulder to another. In the distance was the disc of the sun and some of the greatest mountain peaks in the world. Each boulder was different, each step we took distinct. The human presence did not matter in that place. I was struck at the idea that the place was indifferent to the fact there had ever been people in the world. Or that we were here now. The boulders had been tossed down by forces more brazen and elemental and fierce than the ones which allowed into being skin and bone, human memory, the careful eye, the wary step, the soul. This was a place which made clear to us the intense majesty and dark persistence of the world. For any artist working with mountain stillness or mountain wind there is a game being played between our mysterious need to create forms, to dramatize the visible world until something of its mystery has been captured, and the possibility that we may in the end leave only vague traces of ourselves behind, that nothing we will do may matter. If we add to this the notion of light and wind, how nothing is stable - no line, no colour - then the idea of making drawings and paintings in a mountain landscape is elusive and shifting. In Joe Wilson’s drawings of the Catalan Pyrenees, for example, there is a sense of contour and structure. That sense is somehow at the core of the drawings, like rock, like something which can be named and measured, pinned down and disciplined. But then there is, against this, or within it, a lovely looseness, which suggests not only raw, uneasy nature - the wind and the changing light - but the very art of drawing itself, something which is done by a fragile and uncertain hand, something which gives in at times to the stray urges of that hand and the mind which tries to govern it, which plays against what is structured and rigid and planned, which accepts the provisional nature of seeing and looking.